This is a really great cake for a Coffee Morning if you need something to take and don’t want to assemble or ice a cake. This is a Mary Berry recipe which I have changed only very slightly. 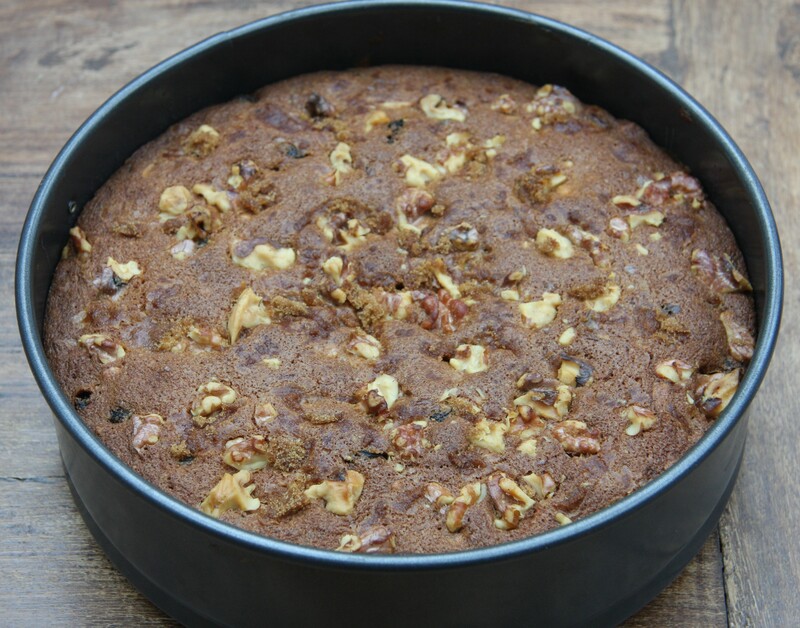 It is a walnut and sultana cake with a layer of cinnamon spiced apple through the middle. 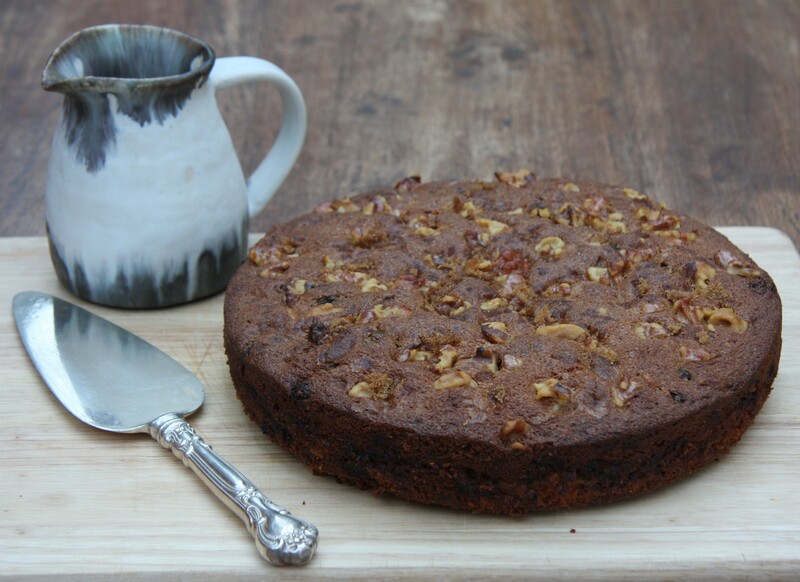 It’s topped with crunchy walnuts and brown sugar and even gives the impression of being on the healthier end of the cake scale: always a bonus. I made this for a school coffee morning and it seemed to be a hit. 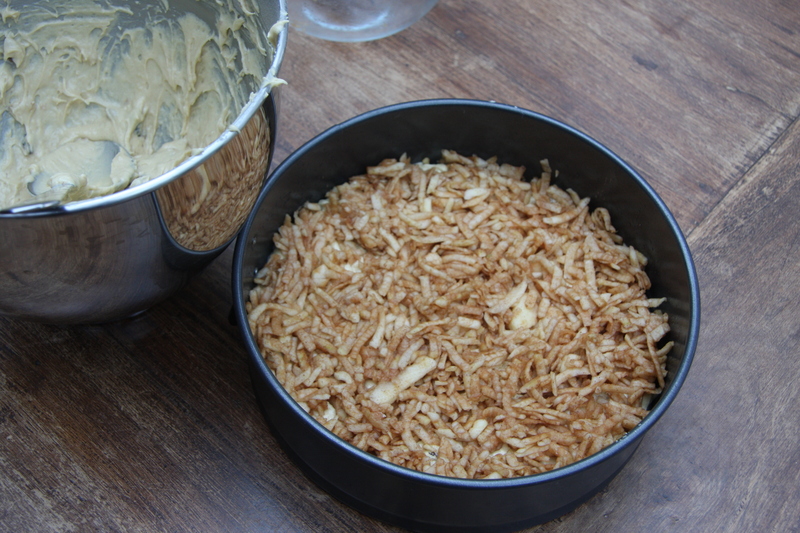 Set the oven to 170ºC and grease and line the base of a deep sided, loose-based 9″ round cake tin. Cream the butter and sugar until pale and creamy. Fold in the flour. 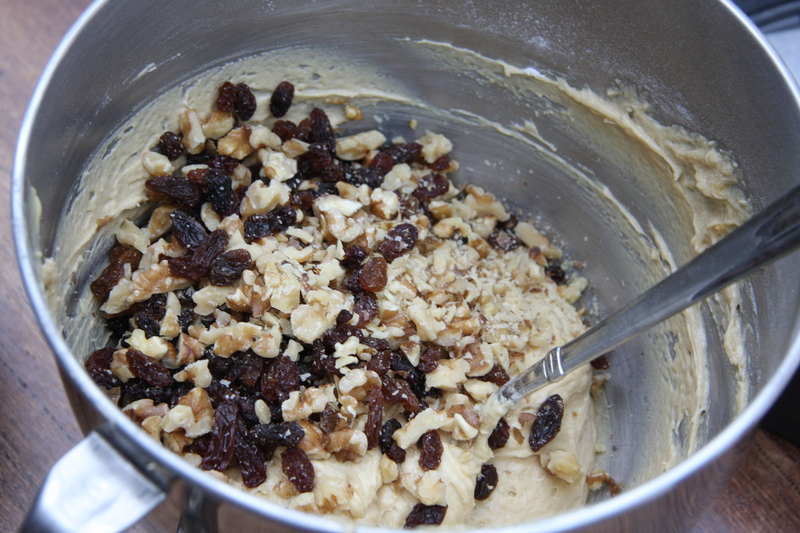 Add the walnuts and sultanas and mix to combine. Mix the cinnamon into the grated apple. Spread half of the cake mixture over the base of the prepared cake tin. Then add the remaining cake mixture and spread out evenly, taking care not to pull up the apple. 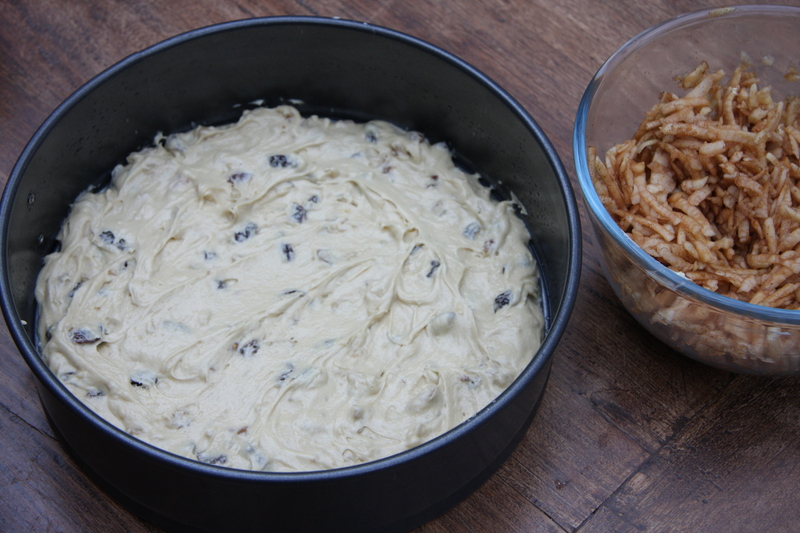 Bake for around 1¼ to 1½ hours, until the cake is well risen and brown, and a skewer inserted into the centre comes out dry. If you want a deeper cake you could always use an 8″ cake tin: just adjust the baking time accordingly. Lovely, will look forward to it! This is right up my alley! Will definitely need to make this one soon! Sounds delish. All my favourite ingredients. Thank you – I hope you enjoy it if you make it. My friend Ela has sent me a photo of the cake as she just made it and you can see the apple layer. Will have to make it again! This cake is delicious, it’s one of the first recipes I made when I started blogging 🙂 love the layer of apple in the middle and the cinnamon! I have yet to taste it but I’ve only heard good things! Thanks for commenting! 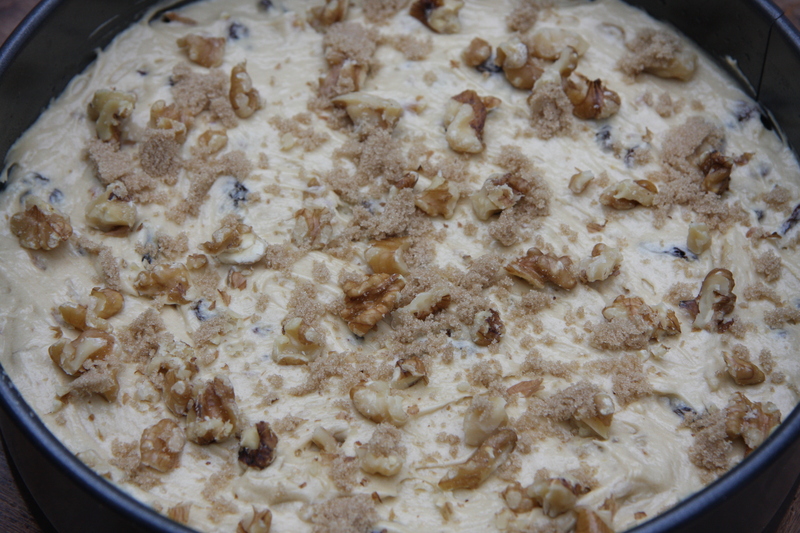 This is definitely my style of a cake with lots of crunch and texture…delicious! Congrats, and may you feel encouraged!